It’s important to Campbell Divinity School that ministers have resources and opportunities available to them throughout the year that enrich them academically, spiritually, and in their ministries. 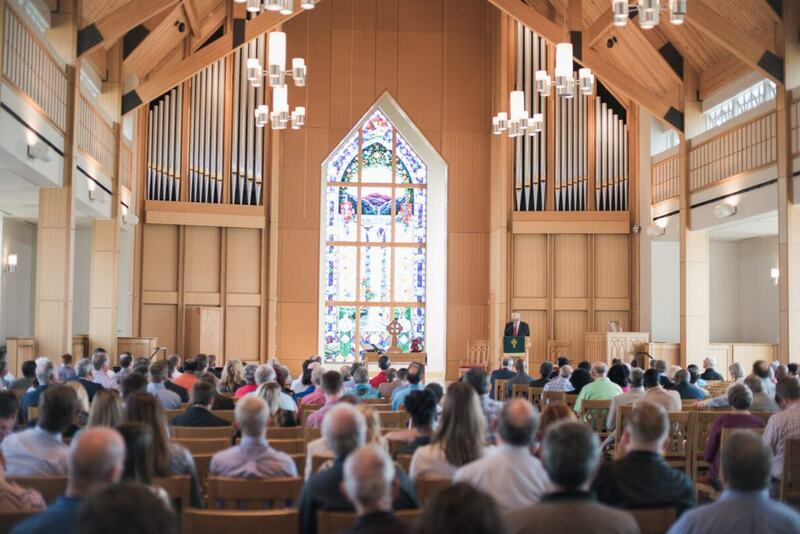 The annual lecture series brings scholars from around the country and world to deliver lectures on a wide variety of topics that are related to evangelism, biblical studies, and preaching. Timothy George has been the dean of Beeson Divinity School since its inception in 1988 and has been instrumental in shaping the school’s character and mission. In addition to his administrative responsibilities, George teaches church history and doctrine. He is a life advisory trustee of Wheaton College, is active in Evangelical-Roman Catholic Church dialogue, and has chaired the Doctrine and Christian Unity Commission of the Baptist World Alliance. He serves as senior theological advisor for Christianity Today, and is on the editorial advisory boards of First Things and Books & Culture. George is the general editor of the Reformation Commentary on Scripture, a 28-volume series of sixteenth-century exegetical comment. A Th.D. graduate of Harvard University, Dr. George acquired his M.Div. from Harvard Divinity School and his A.B. from the University of Tennessee at Chattanooga. Dr. George has written more than 20 books and regularly contributes to scholarly journals. His recent books include Reading Scripture with the Reformers, The Great Tradition of Christian Thinking: A Student’s Guide (with David Dockery), Our Sufficiency Is of God: Essays on preaching in Honor of Gardner C. Taylor (with James Early Massey and Robert Smith, Jr.), and Amazing Grace: God’s Pursuit, Our Response. His Theology of the Reformers (25th Anniversary ed., 2013) is the standard textbook on Reformation theology in many schools and seminaries and has been translated into multiple languages. An ordained minister in the Southern Baptist Convention, George has served churches in Georgia, Massachusetts, Kentucky, and Alabama. He and his wife, Denise, have two adult children. L. B. and Mabel Reavis felt a deep desire to establish a program at Campbell University designed to promote the ministries of Evangelism and Church Growth. This led them to establish the L. B. and Mabel Reavis Professorship and Scholarship Program in 1991. Funding from this program is used to invite distinguished scholars to teach in the fields of Evangelism and Church Growth. For 21 years, this program has featured many Christian leaders on a variety of topics and has fulfilled the vision of the Reavis family. Ellen F. Davis is the Amos Ragan Kearns Professor of Bible and Practical Theology at Duke Divinity School. The author of ten books and many articles, Dr. Davis’ research interests focus on how biblical interpretation bears on the life of faith communities and their response to urgent public issues, particularly the environmental crisis and interfaith relations. Her recent book, Biblical Prophecy: Perspectives for Christian Theology, Discipleship and Ministry (Westminster John Knox, 2014), explores the prophetic role and word across both Testaments of the Christian Bible. Scripture, Culture, and Agriculture: An Agrarian Reading of the Bible (Cambridge University Press, 2009), integrates biblical studies with a critique of industrial agriculture and food production. Her most recent book, Preaching the Luminous Word (Eerdmans, 2016), is a collection of sermons and essays. A lay Episcopalian, Dr. Davis is active as a theological consultant within the Anglican Communion and since 2004 has worked with the Episcopal Church of Sudan and South Sudan to develop theological education, community health, and sustainable agriculture. A Ph.D. graduate of Yale University, Dr. Davis earned her M.Div. from Church Divinity School of the pacific, Certified Theologian from Oxford University, and the A.B. from the University of California, Berkley. With this in mind, the Prevattes established the E. J. and Amaretta Prevatte Biblical Studies Lecture Series in which was announced in May 1985. Tuesday, 10:40 a.m. and 2:30 p.m.
Robert Smith, Jr. holds the Charles T. Carter Baptist Chair of Divinity at Beeson Divinity School where he teaches Christian Preaching. Previously he served as the Carl E. Bates Associate Professor of Christian Preaching at the Southern Baptist Theological Seminary in Louisville, where he received the 1996 Findley B. Edge Award for Teaching Excellence. An ordained Baptist minister, he served as pastor of the new Mission Missionary Baptist Church in Cincinnati for 20 years, and earned his Ph.D. while serving. Dr. Smith is author of the multi-award winning book Doctrine That Dances: Bringing Doctrinal Preaching and Teaching to Life (2008). His most recent book, The Oasis of God: From Mourning to Morning – Biblical Insights from Psalms 42 and 43 was published in 2015. He is a contributing editor for a study of Christian ministry in the African American church, Preparing for Christian Ministry, co-editor of A Mighty Long Journey, and an editor of Our Sufficiency Is of God: Essays on Preaching in Honor of Gardner C. Taylor (2010). Dr. Smith has spoken at over 100 universities, colleges, and seminaries in the US and around the world. He earned his Ph.D. and M.Div. from The Southern Baptist Theological Seminary, B.S. from Cincinnati Bible College, and A.S. from God’s Bible College. He was also awarded an honorary Doctorate of Sacred Theology from Temple Community Bible College. He and his wife, Dr. Wanda Taylor-Smith, Ph.D., are the parents of four adult children (one in heaven). In appreciation of Dr. James Cammack’s love and legacy of preaching, his son, Chris Cammack, established the James C. Cammack Institute of Preaching Lectures in 2011. These events are offered at no charge and will include a ministry focus, a biblical focus, an academic focus, and a preaching focus. The lectures will be held in the Robert and Anna Butler Chapel. Follow Divinity School event signs for parking. Mark your calendars now! Bring another minister with you and join us for any or all of these spiritual growth opportunities. These speakers will encourage you, stretch you, and inspire you. Campbell University provides a variety of venues for any meals you want to purchase. We are glad to provide these growth and renewal opportunities for you. For more information, contact Joyce Mashtare by email or at 1-800-334-4111, ext. 1849. Please call numbers listed below and mention the Ministers Continuing Education Program at Campbell University Divinity School for reduced rates.